In the previous post I’ve introduced an experimental 7 Taskbar Tweaker version for Windows 8. It had a number of flaws, and didn’t support Windows 8’s multiple taskbars. Windows 8 version is stable now, get it here. Please report any issue that you encounter. Remember that this version is designed for Windows 8 Release Preview only, and would not work as expected on earlier builds of Windows 8. It should work well on Windows 7, though. P.S. : I think about renaming the tweaker to 7+ Taskbar Tweaker. What do you think? Posted in Software, Updates by RaMMicHaeL at June 30th, 2012. Wow everything works in this version. In the earlier versions, some settings like double click on empty space to show whatever weren’t working. And the hex edits I make to restore the launching animation and minimize ability to non-minimizable windows also work. Thanks. I tried all settings and so far they’re working on Windows 8 x64 RP. Can you tell me the exact error message text? Also, did you extract all the files before running? I’m so glad, RaMMicHaeL, that you are working so hard to make our lives easier. I’ve been using your tool for as long as I’ve used Windows 7, and I’m so grateful. I am so thankful that you are working to make this tool usable for Windows 8. Thanks so much. 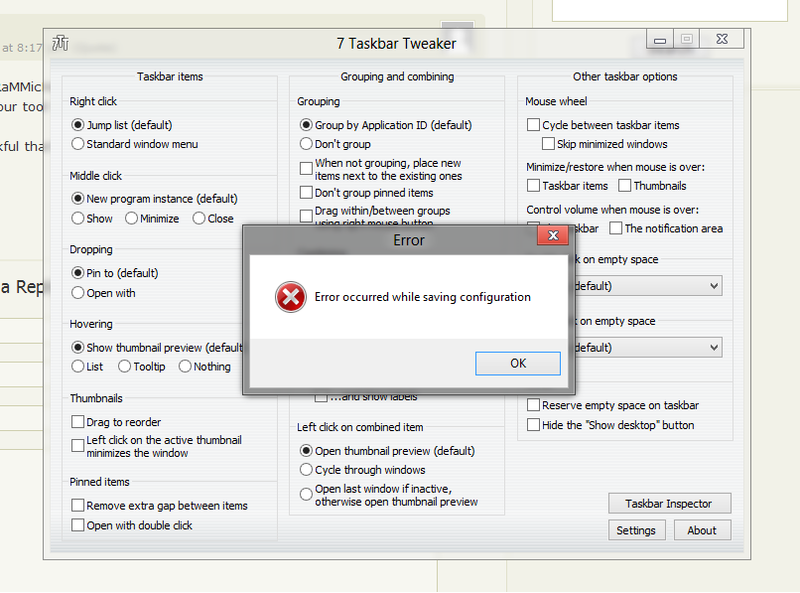 This error means the tweaker failed to save the configuration to an .ini file. What folder did you put the tweaker in? Make sure the folder is writable (e.g. not “Program Files”). Well, it’s probably a bug, then. I couldn’t reproduce it on my Windows 8 RP x64. I can make a debug version with detailed output, so I can see what the cause of the error is. Are you willing to cooperate? The thing it that it’s going to work on both Windows 7 and Windows 8. I decided to name it “7+ Taskbar Tweaker”. Bless you for this! You have done your bit for the world, making windows7 less intolerable. I think 7+ Taskbar Tweaker is not a bad name, but it still refers to 7 or win7, etc. But it shouldn’t. You don’t need to tie the name of your great software to Microsoft’s naming conventions. Your software is special. It fills gaps, extends functionality, and makes people’s life much better! Your software is simply T H E Taskbar Tweaker. When I type Taskbar Tweaker into Google, your software appears first. By the merest chance? So I think you can easily omit 7 or 7+ !